What better way to have ice cream then to transform your teachers and principal into human ice cream sundaes. 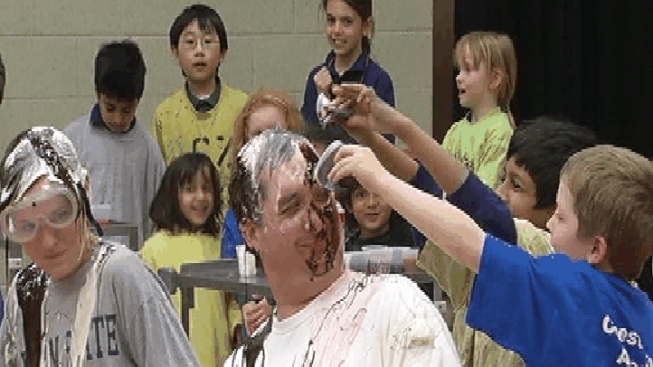 The staff was covered with the traditional ice cream toppings, fudge, cherries, whip cream, ice cream, and much more. In celebration of national reading month students at Chesterbrook Academy Elementary School in West Chester, Pa were challenged to read 1,000 books in the "Read like a Movie Star" campaign. For every extra 500 books read, that added one teacher to the list of the human ice ceam sundaes. The students ended up reading 4,000 extra books.